The buyer of this boat had owned several previously, some large. When he analysed what he enjoyed doing on the water he realized that a lot less boat would do the trick. And while he was downsizing he might as well simplify too. 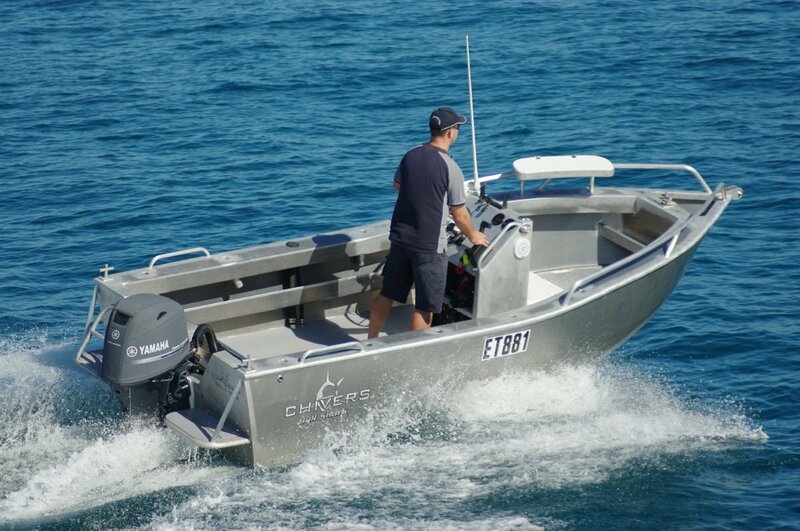 He bought a Chivers Bull Shark 485 centre console and started deleting the options. Paint was the first to go: he did not want the agonizing wait for the first scratch in the two-pack. The other deletions reflected the average length of his trips – under three hours – and how he used the boat. Crabbing and inshore fishing with his two children were the big things; for these, clear deck and clear rail were important, so no seat was fitted and no canopy. The lack of shade would be fixed with big hats and sun screen. A windscreen seemed out of character so that went too. The electronic fit out is an area where simplicity was not wanted. When most of your boating is done in hours grabbed before and after work you want to avoid wasted time. The Lowrance HDS-9 touch screen combination has a Structurescan transducer that does magical things. The sounder has high frequency and high resolution characteristics that are ideal for the under 30 metre depths usually worked. The Structurescan gives picture-like images of the bottom to assist even mug anglers. Children seem to want accompanying noise; this is supplied by the other electronics, a Fusion AM-FM stereo fitted with Bluetooth. There is not going to be a lot of storage space in a stark boat like this, and nor is much needed. There are two lockers in the quarters, one taken up by the fuel filter, side pockets and a pocket across the bow. The console houses a pair of batteries, their distance from the motors compensated for by heavy cables. The owner had considered using portable tanks but decided he was on the water often enough to justify keeping the 50 litre built-in tank. The tank feeds a 60hp Yamaha four-stroke that proved a good match with the hull. Top speed around 30 knots and barely burbling at a more realistic 20 knots. The Yamaha fuel use gadget showed excellent economy at that speed: two nautical miles per litre. There is very in the boat specifically designed for fishing and crabbing, but in use I found it worked very well. You do a great deal of low speed wheel turning picking up crab nets, and the Bull Shark has two things that remove the labour from that. Hydraulic steering is a noticeable number of dollars extra, but the steering wheel with a knob for one-handed operation is a low cost boon. The drop-in bait board is mounted on the port bow, which is logical: not taking space in the busier parts of the rail. And that, apart from rod sockets in the coamings, sums up the specialized fishing features. Bring your own esky for the catch. The hull itself made an impressive fishing platform. With two light-heavyweights on board moving at random (four is the official limit), it felt nailed to the water. The freeboard is generous for an under five metre boat, and plenty of grab railsgive extra assurance. Downsizing boats can be liberating. The quicker cleaning and lower maintenance are good points, but also you find yourself using it more; towing long distances becomes a breeze. Your partner, who felt uneasy driving with a big load astern, barely notices this small one. The Bull Shark’s owner also finds his rugged, near indestructible boat makes a fine auxiliary trailer for all the holiday gear.